Firefighters minimized damage at a garage fire Thursday and battled flames in multiple trailers Friday. 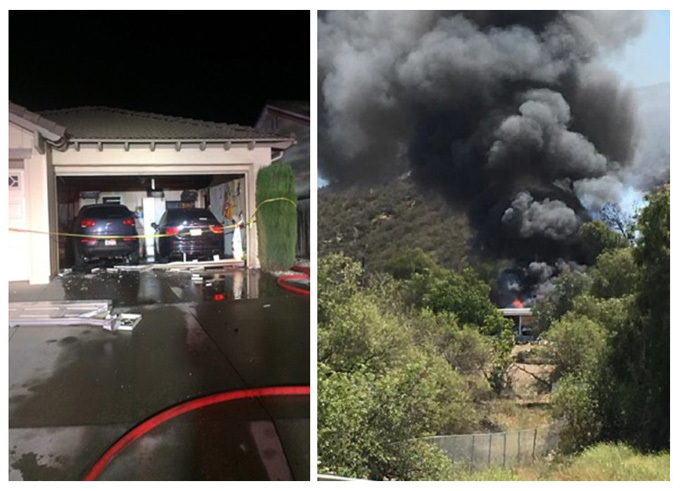 Murrieta firefighters knocked down two fires in the city in the last two days. Just before midnight on Thursday, the Murrieta Fire Department responded to a structure fire in the 42000 block of Iron Gate Lane. Crews observed smoke coming from the garage and determined the flames were spreading to the living area. They were quickly able to contain the fire and to rescue a small dog that was inside the house after the occupants evacuated, according to a news release. The damage was estimated at $75,000. The cause of the fire remains under investigation. At 11:37 a.m. on Friday, firefighters responded to the report of a mobile home fire in the 28000 block of Mary Place in the Los Alamos Hills area. Crews arrived to find multiple trailers on fire and an adjacent mobile home threatened. Firefighters extinguished the fire within 30 minutes, keeping the fire from spreading to brush and trees in the area. One person was displaced from the home. Damage was estimated at $35,000. Investigators determined the fire was accidental.